Football is the nations favourite game. Over 13 million people watch a football match every year in the UK. Even more, watch on TV, and then there are the thousands of people, male and female, who play the game on a regular basis too. Newcastle United FC is our local team and one I have supported since I was a child. 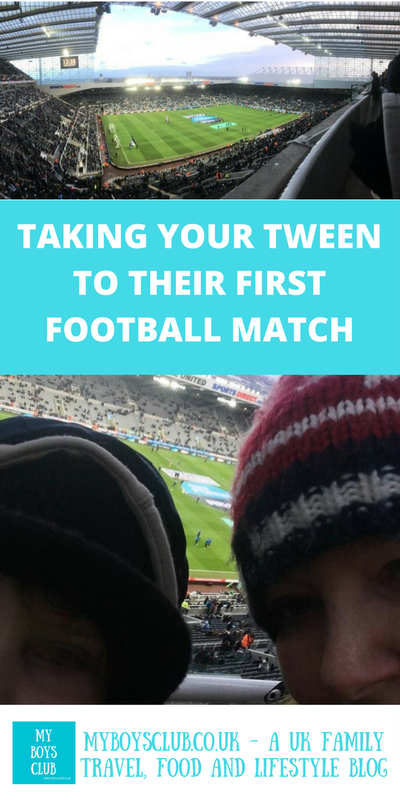 Over, 50,000 people watch every home game live in the stadium of St. James Park and I was really excited to get the opportunity to take my tween to his first footy game. We were in the fortunate position to receive two tickets for the Newcastle United home game against Brighton and Hove Albion FC in between Christmas and New Year. So it would be Magpies against Seagulls! As much as hubby and I would have liked to repeat our pre-kids regular jaunts to watch the footy, one was an adult ticket and the other a junior. So the perfect opportunity to take our eldest to his first game at St James Park - home of Newcastle United FC. Also known as the Toon Army and the Magpies. My eldest is now 10, he enjoyed the open training session at St James Park that Newcastle put on for its fans but this would be his first proper match. I've written before about my love of football stemming from when I was a child and the influence of not only family but an inspirational teacher. One of my first games was with an older cousin on New Year's Day one year. This was before stadiums were all-seater and I remember not being able to see very much, being in amongst adults, even though we were in the family section. No such problems today. Our seats were high up (there are 140 steps to climb to reach the family section - so a good work out for the legs too) but in the front row of the corner between the Milburn Stand and the Leazes End, so there would be nobody blocking our view. When I returned to football matches as a teenager me and my friends always stood in the Gallowgate end of the ground. In the score aid section, not the corner as I remember us calling it. It was always friendly and we were always given a helping hand by the older male supporters, to sit on one of the concrete barriers to ensure we could see - we had to hang on though when a goal was scored as it was easy to get pushed off in the celebrations. I dug out my old Newcastle scarf from the 80's (I don't remember it being quite so short, but I was a child then, I suppose) and we both wrapped up warm and headed to the match for the 3pm kick-off. St. James Park is located in the city centre. I love this and it makes it very different from most other Premier League and Championships clubs. The football club really is at the heart of the city. We took the bus to Grey's Monument in Newcastle, giving ourselves plenty of time to take in the atmosphere around the ground, go to the toilet and find our way to our seats - thanks for the tip Carolin. We walked along Blackett Street, past Old Eldon Square, following other fans, easily identified by their hats and scarves, and all heading the same way! After crossing the road we headed up past the Labour Club, and along Gallowgate where we got sight of the stadium for the first time. 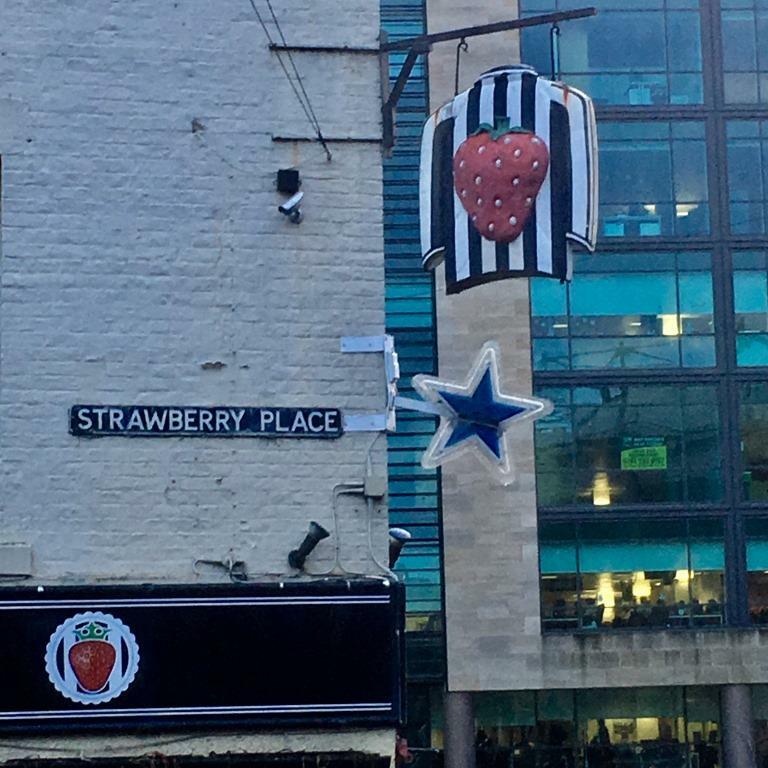 The famous Strawberry Pub is located here opposite the statue of Wor Jackie, the Joe Harvey plaque on the wall and also just along from the collection point for the Newcastle West End Food Bank. Sadly, there is a need for a collection point, but on a positive side, each match day generates lots of food donations and also cash donations often in excess of a thousand pounds. The NUFC Fans Food Bank - which performs collections before every home match, as well as in its store in the Grainger Market - has been a gamechanger for the West End Food Bank. Read more about it here. After we had donated some money then headed back across the road and into the stadium. We stayed away from the Club Shop, it had only just been Christmas we didn't need to buy anything else, - thanks for the tip Dan. We did buy a programme to keep as a souvenir - thanks Emma for the tip. I was pleasantly surprised to see they only cost £3 - programmes at music concerts and theatres can cost a lot more. Just before you walk under the Milburn Stand you pass the Bobby Robson statute. Then we looked out for our gate number. Gone are the days of handing over a paper ticket - but that would have been nice to keep - nice idea Maria. Tickets are now credit card sized and simply go in a slot, it beeps and you push the turnstile. I had forgotten just how narrow a turnstile is. Then we climbed the 140 steps up to Level 7 and were greeted with this view. We could see our house from our seats. It's high up but you do get a great view of the whole pitch and for a youngster, it makes it really easy to follow the game. Our most recent seats when we regularly went to the match were pitchside, close to the Gallowgate end penalty area. There, you are amongst the action, and so close to players but it's not always that easy to follow the whole game. It often looked like an entirely different game when you watch it on Match of the Day, later that night! Anyway, we found our seats sat down taking in the atmosphere. We took lots of photographs, selfies and video - thanks Simone for reminding us to do it. Our seats were right at the front with no one blocking our view, but if you have a choice aisle seas are a good idea if you think your child may need to get out of their seat a lot - good tip Suzie. The teams were out warming up, then the teams announced, and then in what seemed to be no time at all, the teams then made their way on to the pitch and we watched and listened as the players were welcomed by the fans. I'm glad to say Local Hero by Mark Knopfler is still played before a match. A great tune that really gets you in the mood for a game. And then it was 3pm and time for the kick-off. I didn't take ear defenders with us - but a great tip nonetheless from Beth. But by being wrapped up warm - thanks, Pete, for the weather (it has snowed the day before) with two hoods and a furry hat covering his ears, my eldest said he didn't need ear defenders as his cold weather clothing was doing a good job of drowning out a lot of the noise. If the game had been better too it might have been noisier! There were a few chants of 'Newcastle, Newcastle, Newcastle' and 'toon, toon, black and white army'. The away fans were pretty loud some of the time. They are now always seated at the top of the Leazes End. The only song I think I could repeat from my days as a youngster at St. James Park is 'N and an E and a WC. A and an S and a T L E. U N I T E D. Newcastle United FC. But that one seems to have disappeared many years ago now. I'd warned my eldest that he may hear a few words said or sung that he maybe shouldn't hear - but he counted them and there were only four he said! Maybe because we were in the family section but I was pretty impressed with that. In terms of facilities there were toilets and a bar area nearby but for halftime, we had taken our own chocolate snacks - another tip from Nicola and Veronica. 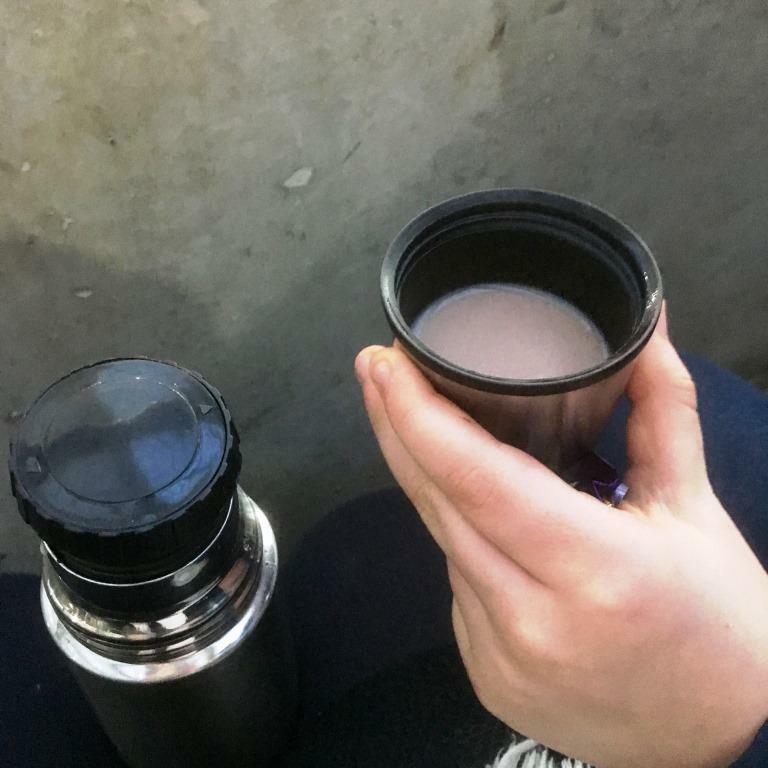 And knowing how cold it can get sitting still outdoors I also took a flask of hot chocolate for us to share - this was a very good idea. The football itself wasn't the greatest. The game ended in a 'nowts each' as we would say. A no-score draw. Giving them each another point in the Premier League Table. There wasn't a hint of trouble anywhere. The crowds exiting the stadium, although very busy, were not pushing and squashing people in the path like I remember, it was all very respectful. My eldest thoroughly enjoyed the occasion and wants to go again. That can only be good for the future of football - if not my wallet! Not the most exciting result or game. Usually, I'd have been bemoaning the lack of skill and creativity along with many other fans afterwards. Not sure I agree with the booing though - they didn't lose! 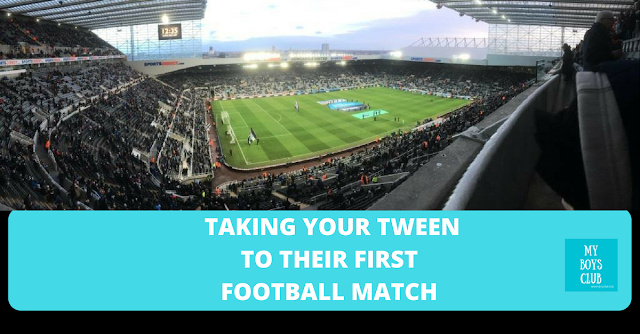 But this match wasn't about the result, although a win would have been nice, but was about taking my tween to his first proper premier league football match, and that in itself at St James Park, watching my team, Newcastle United, was a great occasion. Have you ever been to a football match?